Back in school (which is some months back) I was a lip balm addict. Along with painting and tennis my hobby was collecting lip balms :P It was fun, and my sweet friends always gifted me them. Tinted ones were my most favorite, I still remember how Nivea Pomegranate lip balm turned me into a diva. I applied tinted lip balm in a heavy layer at night and assumed that it made my lips look really pink, the next day( I was not a beauty addict you see). While I had awesome experience with many lip balms, I even had horrible experience with some. 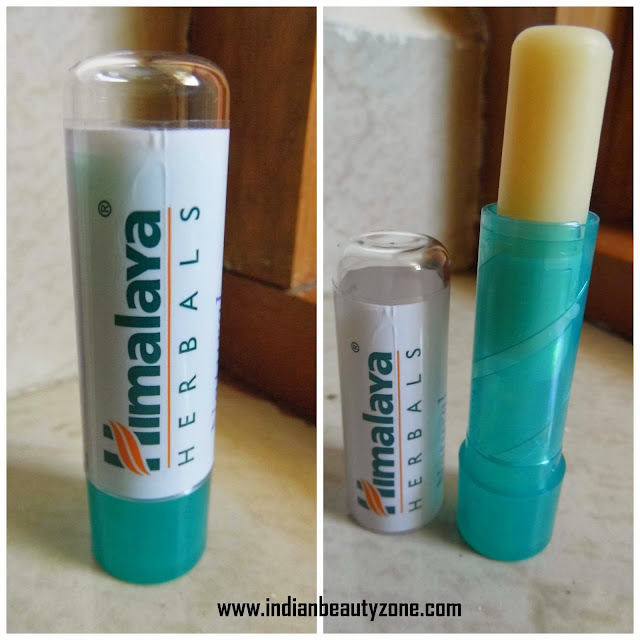 One such lip balm is this HIMALAYA one. Nothing great, just a typical cylindrical twist up mechanism one. It looks extremely cheap. I just dropped it down once, and yes the cap broke. Open the cap, twist it up and you get an extremely horrible smell. I don’t know how to describe (I don’t want to) but it has an awkward chemical fragrance. So artificial I completely dislike the fragrance. This is again horrible. It is not smooth at all. If I mean it’s not smooth I mean I had to literally drag it on my lips. This made my dry lips even worse. I used it for three days. Usually I wore it in the night somehow dragging and pulling it, and saw the magic of my dry lips even more drier!!!. It is a non tinted lip balm and it is kind of waxy and it just sits like a stubborn donkey on my lips, the next morning I can see a rubbish white layer on my lips. where the hell is the result? Just like my practical exam scores it flopped. Not just flopped, but made me literally cry by irritating and emphasizing my dry lips. Not to forget the waxy feel, horrible fragrance, rubbish white layer etc. I don’t recommend this to anyone. It may work for you, but not for me. I had good experience with many Himalaya products but this was a complete failure. It was my first lip balm.. I am still addicted to lip balms. Been using a few brands until now but I have to skip Himalaya after reading the not nice things about it. You can see if it works for you ..
Not just bad, I mean awkward .. !!! The only good thing about it is that is cruelty free! A big nayyyyy! I like that fact too..
Great review, you are really honest!!! Great review do not know if I will buy due to your cons. It just flopped on me, may be It would work for you..! I love Himalaya. And I'm so happy that now I can find this Brand in Doha! I like them for the face packs..
i always love himalya product but this is the first bummer!